For as long as most of us can remember, the symbol of Royston has been the crow, specifically the Hooded Crow or Corvus cornix. Widely distributed, it is also known as the Scotch Crow, the Danish Crow, and in Ireland the Grey Crow, which is also what its Welsh name, Brân Lwyd, translates as. Found across Northern, Eastern and South-Eastern Europe and the Middle East, it is an ashy grey bird with black head, throat, wings, tail and thigh feathers, as well as a black bill, eyes and feet. 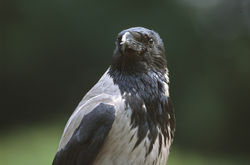 At one time the hooded crow was a more common visitor to Hertfordshire, so much so that it became widely known as the Royston Crow. During the English Civil War, Cromwell’s Roundheads derided the town’s inhabitants after a brawl with local Cavalier sympathisers, calling them “crows”. The name has remained. The 150-year old local newspaper is still titled the "Royston Crow", and depicts the bird on its masthead.